IRWIN, Pa.—Mitt Romney unveiled an aggressive new stump speech Tuesday, accusing President Barack Obama of being too cozy with political donors and suggesting the president wants Americans to be "ashamed of success." Speaking to several hundred supporters at a wireless services company outside Pittsburgh, Romney took aim at Obama's comments at a campaign event in Virginia last Friday in which he emphasized the role government played in building private enterprise. "Somebody helped to create this unbelievable American system that we have that allowed you to thrive," Obama said Friday, citing the teachers and people who build "roads and bridges." He continued: "If you've got a business, you didn't build that. Somebody else made that happen." Romney seized on Obama's comment, calling it "foolishness" and "insulting to every entrepreneur and every innovator in America." He said it exposed what Obama "really thinks" about the country and argued it was more proof that the president's administration is hostile towards business. "President Obama attacks success. And, therefore, under President Obama, we have less success," Romney said. "I will change that." Addressing the crowd in a more passionate tone than he has exhibited on the campaign trail in months, Romney called Obama's comments "startling and revealing" and said he found it "extraordinary that a philosophy of that nature would be spoken by the president of the United States." Linking back to an argument he made early in his campaign but has not repeated in recent months, Romney argued that Obama's comments were proof that that the upcoming election is about the country's "soul." "This campaign is to a great degree about the soul of America," Romney said. "Do we believe in an America that is great because of government or do we believe in an America that is great because of free people allowed to pursue their dream and build their future?" Lis Smith, an Obama campaign spokeswoman, trashed Romney's "over the top attacks." Coming after days of criticism from fellow Republicans that he hasn't shown enough "fight" in the race, Romney's remarks were longer than his usual stump speech—lasting almost a half hour. And, unlike other recent speeches, he repeatedly made mention of "God," telling the crowd that the country was created by "God's will," not government—statements that elicited wild cheers and applause from his fired-up crowd of supporters. The presumptive GOP nominee renewed his attack launched Monday, in which he accused Obama of rewarding political contributors and supporters with political stimulus funds and access to federal loans. "I'm ashamed to say that we're seeing our president hand out money to the businesses of campaign contributors," Romney said at one point. But Romney largely focused on the larger picture of what he called Obama's hostility toward business—which he argued has been a setback to efforts to revive the economy and has, in turn, made life tougher for struggling Americans. He accused Obama of "crushing economic freedom" in the country with burdensome regulations. 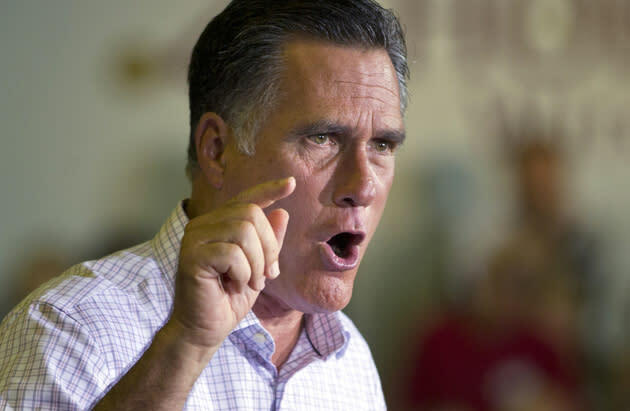 "I'm convinced he wants Americans to be ashamed of success," Romney declared. "I want Americans to welcome and celebrate success and to encourage people to reach as high as they can. … I don't want government to take credit for what the individuals of America accomplish." Romney called the upcoming election a "defining choice about what America is going to be"—a choice, he said that will not only impact future generations of Americans but the "world."